Meet your new favorite weeknight pasta dish—a 30-minute wonder tossed with Italian sausage, ham, shrimp and shredded mozzarella. Heat 1 Tbsp. of the dressing in large skillet on medium-high heat. Brown sausage 10 min., stirring occassionally. Add remaining dressing, ham and tomatoes; bring to boil. Reduce heat to low; simmer 7 to 10 min. or until sausage is cooked through. Add shrimp; cover. Cook 3 to 5 min. or until shrimp is pink. 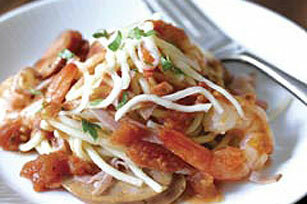 Serve over hot cooked spaghetti; top with mozzarella. Serve immediately. Garnish with fresh chopped parsley, if desired. Try adding other vegetables with the tomatoes, such as sliced green or red bell peppers, sliced black olives, chopped artichokes or sliced mushrooms. For an extra spicy dish, add 1/2 tsp. crushed red pepper to tomato mixture.